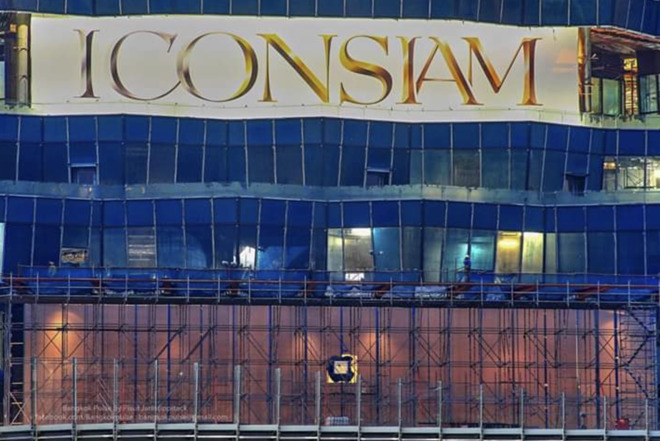 The first Apple Store opening in Thailand has seemingly been confirmed as images of the ICONSIAM construction site make their way online, clearly revealing the company's trademark fruit-shaped logo prominently displayed on the building's glass facade. Apple's flagship retail installation could open later this year, as the mixed-use facility is slated to start operations in November. Photos of the Apple logo at ICONSIAM were posted to Facebook page Storytelling Krung Thon Buri Sri last month. Twitter user ColdJerky informed AppleInsider of the posts on Thursday. Built along the Chao Phraya River in Bangkok, ICONSIAM and its adjoined ICONLUXE retail complex promise to be one of the city's largest shopping outlets. The massive facility also includes two residential condominium buildings in Magnolias Waterfront Residences and The Residences at Mandarin Oriental, Bangkok. This will be the first Apple-owned retail experience in the country, and it comes at a time where Eastern countries such as China and India are increasingly important to Apple's bottom line. Apple was previously rumored to open an outlet in the new Singha headquarters building, a 36-story skyscraper currently under construction in Bangkok, according to the Skyscraper City forum. Singha is a Thailand holding company that manages several different brands that produce various sodas, beers, and packaged foods. Another Bangkok Apple Store could pop up at the CentralWorld mall, though details on the supposed outlet are scarce. For its part, Apple has not officially announced a retail presence in Thailand. Check out Apple's other retail developments in AppleInsider's running story.